Thousands of federal workers lost jobs, and millions will stay at home without pay due to budget cuts. Five workers share their tough choices. On Feb. 27, Ramos was laid off from his contract job as a supply technician making $40,000 a year at the Pearl Harbor Naval Station in Hawaii. Ironically, Ramos had hoped to celebrate his promotion to a permanent position on that same day. But his job was cut even though his boss said Ramos was "mission critical," and fought to keep him. 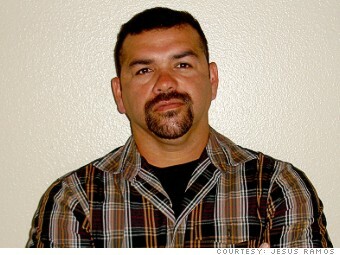 Ramos is a veteran with 20 years of service with the U.S. Marine Corps. As sole breadwinner to his family of four, with a daughter in college and a son in high school, he knows the cuts will hurt soon. For now, he's considering selling one of his two cars, so he can keep his motorcycle. And he hopes to land a job soon from the applications he has sent to Hawaiian Airlines and contractors in Iraq and Afghanistan. "I'm a Marine, so when it comes to leadership, management, whatever it is, I can do it," Ramos said. He blames the cuts and his job loss on President Obama, who he believes hasn't done enough to cut the federal budget in smarter ways. Have you received a furlough or termination notice from the federal government? We want to hear from you. Email us your story and you could be a part of our ongoing coverage of federal budget cuts. Am I too old to be hired?